Ness Ziona, Israel – January 9, 2019 - Newsight Imaging, an Israeli startup that develops CMOS Image Sensor chips for machine vision geared to the robotics, automotive, Smart City, Industry 4.0 and mobile devices markets introduces the NSI3000EVBX, a full reference design kit for advanced 3D depth imaging. The kit is designed for use with Newsight Imaging’s NSI3XXX line sensor family, which supports its patented eTOF™ technology. The field-proven patented eTOF™ technology delivers accurate, long distance and high frame-rate acquisition of depth points, in addition to unique solutions such as reflection filtering. Unlike other technologies, calculation of each depth distance point with eTOF™ technology requires minimal clock cycles and a small number of frames; this makes it wellsuited to low power consumption devices, such as mobile devices, including smartphones, while significantly reducing overall costs. According to Yole Développement, the depth sensing consumer market is expected to reach $6B in 2022, driven by Mobile phone applications. 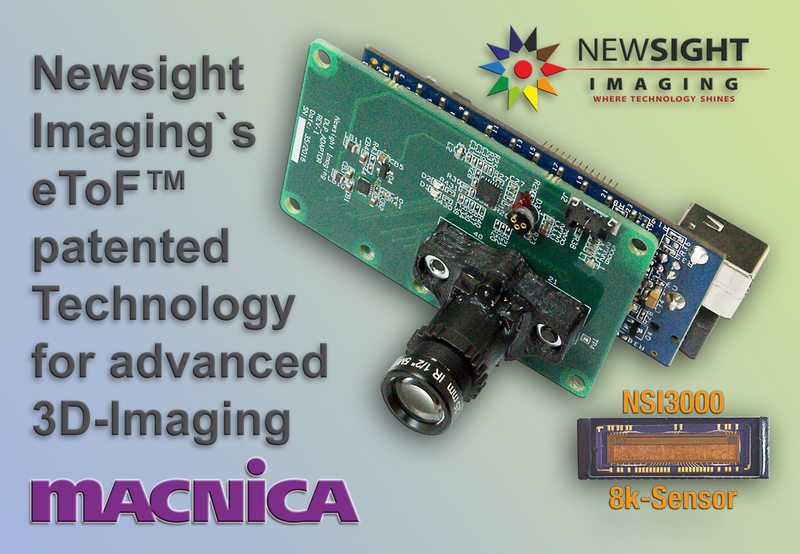 Newsight Imaging Ltd. develops state-of-the-art CMOS image sensor chips and of-fers 3D solutions for volume markets. The sensor is manufactured in CMOS technology with extreme photosensitive pixels and replaces more expensive CCD sensors and other camera modules in LiDAR applications for robotics, automotive (ADAS and car safety) and drones, as well as in other markets such as mobile depth cameras. AR/VR, Industry 4.0 and barcode scanner. Newsight's NSI3000 family is already on the market with major customers and a large pipeline of evaluations. Newsight's patent-pending eTOF (Enhanced Time-of-Flight) technology closes the gap between iTOF for short distances and the automo-tive long haul requirements by extending the dynamic range while maintaining high accuracy.